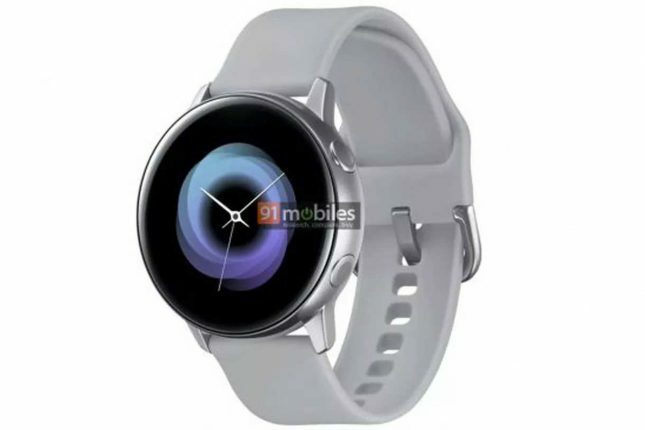 A new Samsung smartwatch has leaked and the wearable is called the Galaxy Sport. The wearable is tipped to be unveiled as a part of the Unpacked 2019 event. Outdoor enthusiasts are the expected target market for the device. Water resistance is claimed, but to what degree is a mystery. The most notable aspect of the leaked rendering posted by The Verge is that the Galaxy Sport lacks a rotating bezel. Previous Samsung wearables have used the rotating bezel as a way to scroll between apps and inside them. The renderings appear to show a pair of circular buttons that will be used for scrolling. The assumption is that the new wearable will be able to track at least as many activities as the wearables that came before. That should mean over 40 activities it can track. Sleep monitoring is expected along with a step counter and heart rate monitor. Specs are tipped to include 4GB of RAM, WiFi, Bluetooth, and NFC.